No matter what the time of year, we could all use a bright citrusy boost every now and again. Enter these extra-lemony lemon bars – packed with gumption and vitamin C to ward off all that scurvy, me hearties. I know we’re smack-dab in the middle of Fall and everybody’s hugging their sweaters, walking through crunching leaves and imbibing in pumpkin-spiced everything but this is exactly when I crave bright lemony flavors the most. Don’t get me wrong, I love fall. Halloween is my birthday, for chrissakes, but there’s only so much pumpkin, butternut squash and apple a girl can handle before she starts craving citrus. As you can probably tell, I really like lemon. And when I eat something that claims to be “lemon”, I want to taste actual tartness, not just sugar that a lemon once sat next to. 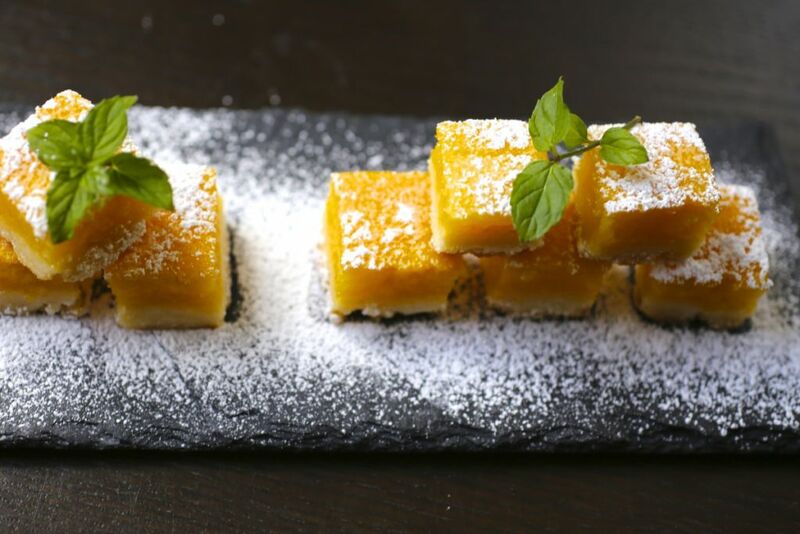 So to these lemon bars (or lemon squares, depending how you slice them). I also think these are just really pretty and would be a lovely addition to any holiday party. In fact, Matt and I usually make them for our Christmas tree-trimming party which is useful since that’s when everyone is most in danger of getting scurvy from lack of sunlight and vitamin C.
I based these lemon bars on a Barefoot Contessa recipe but I kicked up the lemon and cut down on the sugar a bit. They’re definitely still sweet so I like to cut them into little one inch squares. I also have the easiest possible method of dealing with the crust which requires no rolling out at all. 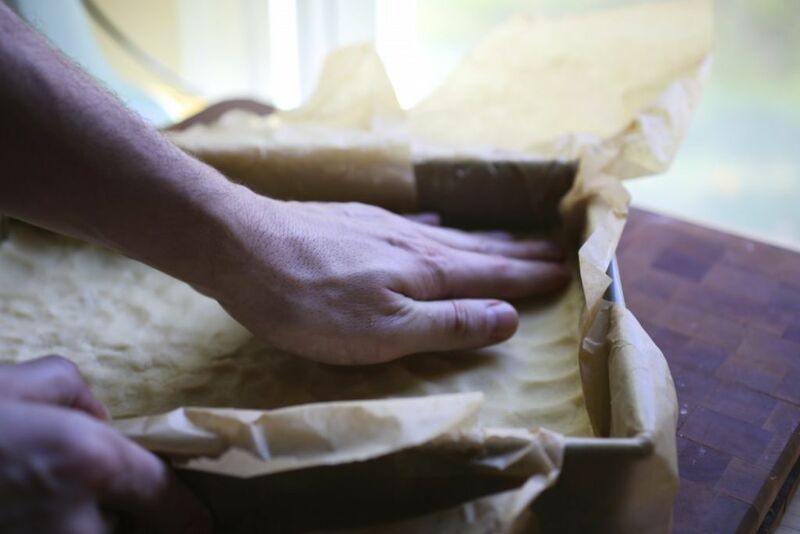 Preheat the oven to 350°F and line a 9 by 13 by 2-inch baking sheet with parchment. 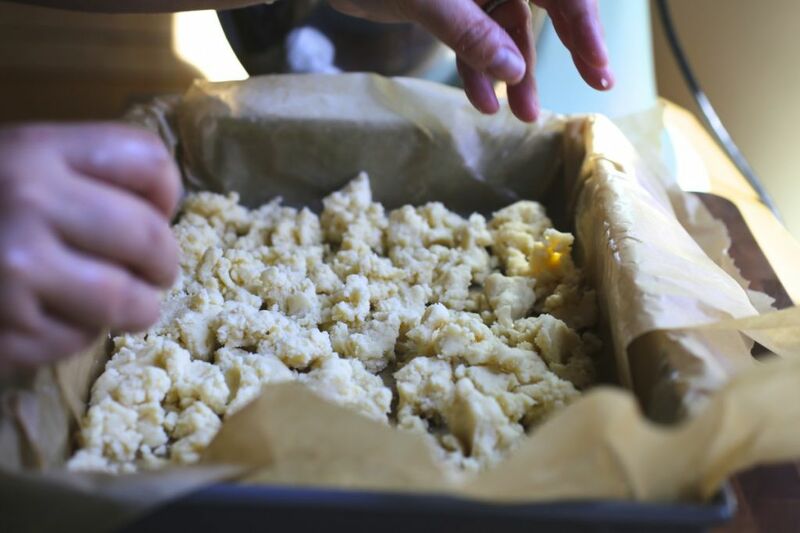 Lightly butter the parchment. Cream the butter, sugar and salt in the bowl of an electric mixer fitted with the paddle attachment. It should look a few shades lighter than when you began. With the mixer on low, add the flour until just mixed. Sprinkle tablespoon-sized chunks of dough all over the bottom on the pan and then press down to flatten and even it into the bottom, building up a ½-inch edge on all sides. Chill for at least 20 minutes. Bake the crust for 15 to 20 minutes, until very lightly browned. Let cool on a wire rack. Leave the oven on. 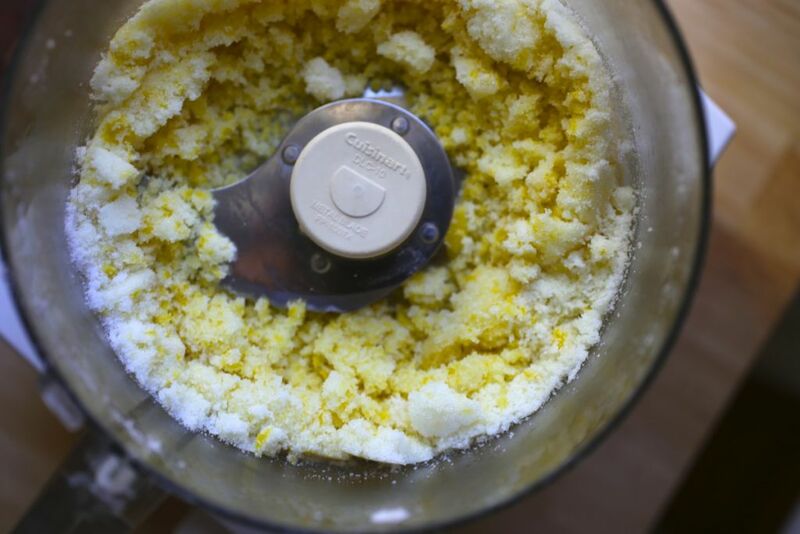 In a food processor, combine all of the lemon peel and one cup of sugar. Process until completely combined, scraping down the bowl and pulsing a few more times until you can’t see anymore bits of peel. 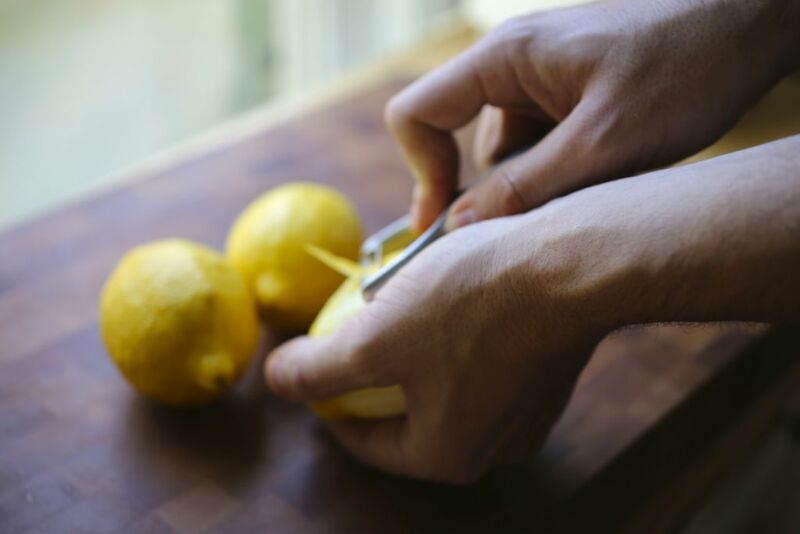 (if you don’t want to use a food processor, you could zest the lemons with a microplane and just add it to the sugar. It won’t be quite as lemony but will still be good). In a large bowl, whisk together the processed lemon zest/sugar, the remaining 1- ¾ cup sugar, eggs, lemon juice, and flour. Pour over the crust and bake for 30 to 35 minutes until filling is just set. Let cool to room temperature. 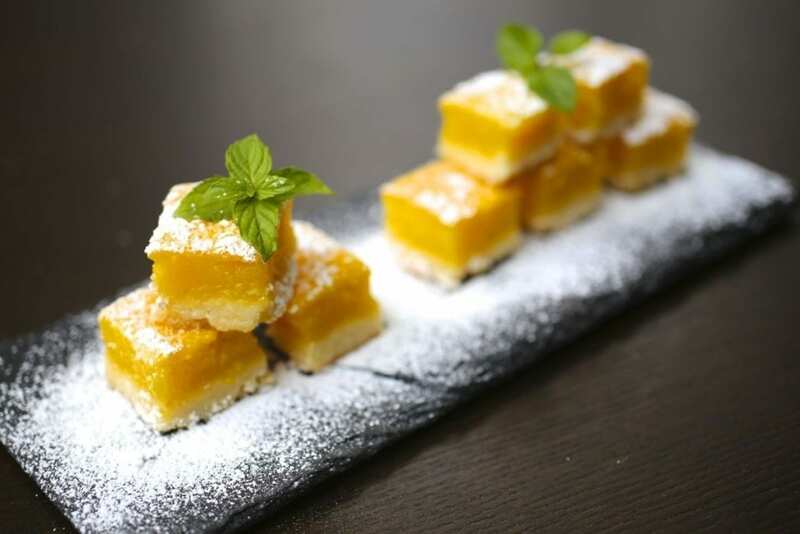 Cut into 1″ squares (or whatever size bars you like) and dust the lemon bars generously with confectioners’ sugar. If the sugar melts on top, just re-dust it and it will stay. they look like delicious little bites! I know that this post is from a while ago- but it is haunting me and so I will comment finally!! It is such a relief and a wonder to see someone else who understands that lemons are to be TASTED! Not drowned in sugar until they are unrecognizable. Sure, they are pretty zippy- and not to be taken straight. But we LOVE them for the flavor and quality. This recipe still celebrates the nature of the fruit, even while turning it into a naughty little treat- YUM. It’s what GOOD cooking and baking is about. Yay to these! And what a wonderful addition to any winter dessert plate, when we all long for a whiff of the warmth and sunshine under which this little fruit grows. The color alone gives me comfort. I say these are the perfect winter treat. Thank you Florida, California, and Nerds with Knives. Can I just say that I love the idea that a blog post about lemon bars was haunting you. Adorbs, as the kids (don’t) say (anymore). Seriously delicious. I used Meyers lemons from my tree, and since they’re sweeter than other varieties of lemons, I cut down on the sugar. I also used 7 large eggs instead of 6 extra-large ones, and it was fine.